This is cartoonist Matt Morgan's response to the Republican waving of the "Bloody Shirt"-i.e., associating the Democrats with the Confederate cause and Reconstruction violence. Here, the former slave is not fooled by the Republican ploy and announces that he will vote for Horace Greeley, a former abolitionist. 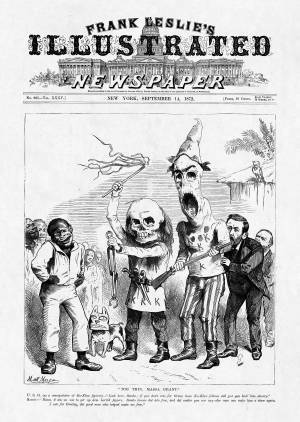 The Ku Klux Klan figures are revealed to be fakes engineered by President Grant in order to scare black men into voting Republican. Senator Oliver Morton stands behind Grant, while Senator Roscoe Conkling appears as a bird perched on the roof.